From the earliest humans that looked to the birds soaring high in the sky down to the frequent flier grumbling their way barefoot through Security, it’s hard not to be awed by the miracle of flight. Every August 19th, National Aviation Day is set aside to take a moment to appreciate humankind’s journey into the wild blue yonder with events, activities, or perhaps just a look up at the heavens. Established in 1939 by President Franklin Roosevelt, the holiday coincides with the birthday of Orville Wright who, along with his brother, helped begin the field of aviation which has taken us from canvas wings on a bicycle into the outer orbits of our world. A hundred years before Jules Vern took us around the world in 80 days, Parisians where getting a bird’s-eye view from the basket of a hot air balloon and are considered the first successful human-carrying flight technology. Evidence shows that unmanned hot air balloons made from rice paper were rising from the ground in China and other parts of Asia at least a thousand years before that. 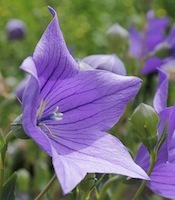 The aptly named balloon flower (Platycodon grandiflorus) gets its name from the purple bud of the flower just as it is about to open. Looking exactly like the air-filled inverted pear of a hot air balloon, the flower opens to reveal a pleasantly petaled bloom that comes in blue, purple, pink or white. Lovely in a vase mixed with delphinium and liatris, this balloon flower is said to represent the desirous return of a friend in the language of flowers. The name aster comes from the Latin, ad astra, meaning “to the stars” and is the perfect name for this star-like flower. Hundreds of different species exist, with most native to parts of Europe. The quintessential daisy with petals surrounding a yellow center, most florists will carry a variety of these year round. The pretty purple or delicate white of the small and clustered “Monte Casino” aster look amazing on their own or added to balloon flowers. The bright petals and round, flat head of the “Matsumoto” asters are larger and come in deep purples and showy pinks. There are lots of different asters to choose from and most will last for a week or more in a vase or other flower arrangement. In the language of flowers, they are said to symbolize sentimental recollection. 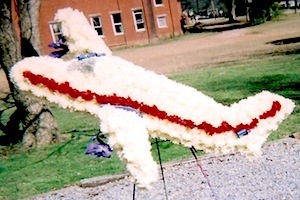 This August 19th, consider giving a flower that’s out of this world to someone in your life who works in the aviation industry, flies a plane in our country’s defense, or simply still looks up at the sky in wonder.